This was my first Met Monday column almost a year ago-- published on March 8, 2009. It is getting to be spring on the prairie! I also have pansies once again (although not flats -- there weren't any but I did get enough for the front planters -- I'll have to wait a bit for the others). It's Sunday and time for Sunday favorites with Chari at Happy to Design and this is a favorite post that I wanted to share with you. 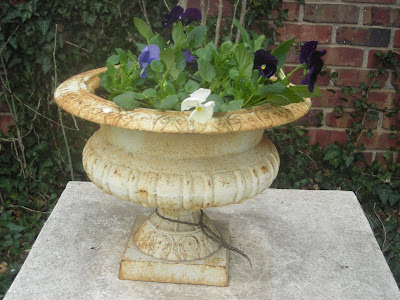 Tomorrow, a second Met Monday (the 2010 version) of transforming planters with sad winter greens into happy spring ones! 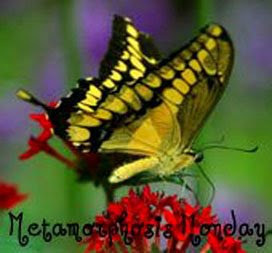 Thanks to Susan at Between Naps on the Porch for hosting Metamorphasis Monday. Metamorphasis don't happen much at Linderhof. We've lived here for 21 years and although we do give a fresh look to tabletops and perhaps buy new drapes or a new sofa or a new chair, there isn't really any "big" change. For the most part we like Linderhof the way it is! But, after a winter of brown (for snow was noticably absent this winter), it was great to see some nice warm weather. Which meant that I could (and needed to) address the planters in the front. The Christmas greens -- having seen a better day (and a better month) were sad as they were real greens and this one lost most of it's needles. Reminds me of a Charlie Brown tree although in early December when I put it in the planter, it looked so Christmasy. 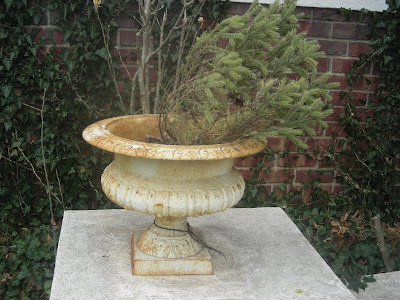 The other planter's tree had most of it's needles but the Kansas wind had definitely given it a tilt. With two flats of pansies and a flat of violas, I was on a misson on Saturay. To breath a breath of spring into the planters at Linderhof. 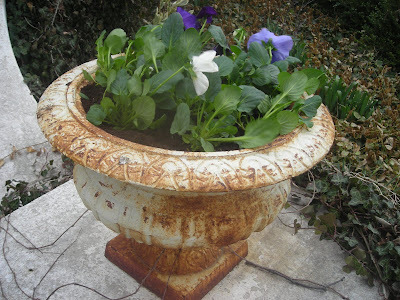 The planters are iron and have some "age" on them. I think they're perfect for the front entrance. Filled with pansies in shades of purple and white, they say welcome to all who come to visit. The wind was blowing madly Saturday (as it so often does on the prairie) and these pansies turned their faces from the wind so only their backsides show. These planters took only half of a flat. I used the rest in other pots -- some around the front door and two by the back door. We're outdoors this weekend too, Martha. IWe're searching for daffodils! Isn't it wonderful how a touch of color brightens things up? We are having such an early spring that all the early flowers will be gone by Easter. And soon our days will be longer, a sure sign that spring is here. My friend, I am sooo ready for Spring! You know, I also live in the prairie lands...eastern Colorado is mostly prairie grass, farmland, etc. The winter cold and wind has taken it's toll...I'm ready for some GREEN! Hehe! I actually looked in Walmart yesterday to see what they had in the way of flower flats...nothing yet! I have 3 large urn planters that cascade down the steps of our back porch. I'm ready to plant some pretty color in them! I usually do petunias as they do very well in that spot but after seeing your gorgeous purple pansies, I think I may give them a try! That area gets morning sun...wonder how the pansies will do under those conditions? I'll have to do a little research! 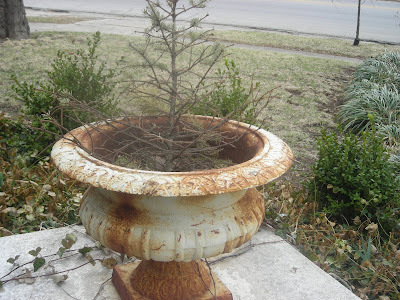 Well my friend, I just love those big ol' iron urns that you have...the rusty patina is beautiful!!! Thank you for sharing your pretties from last spring with us today for Sunday Favorites...it was like a breath of fresh air! I'm looking forward to seeing Linderhof in a couple of months...it will be soo pretty!!! I love your gardens!! !